According to European Central Bank Governing Council member Ewald Nowotny, Federal Reserve Chairman Ben Bernanke sees no risk of inflation in the United States. According to Nowotny, Bernanke had given a “very optimistic” portrayal of the US outlook. “They see absolutely no danger of an expansion in inflation,” Nowotny said. Bernanke had said US inflation should be 1.3 percent this year. Fed forecasts put inflation by the end of this year in a range of 1.3 to 1.7 percent. The yearly rate of growth of the consumer price index (CPI) stood at 1.5 percent in March against 2 percent in February and 2.7 percent in March last year. 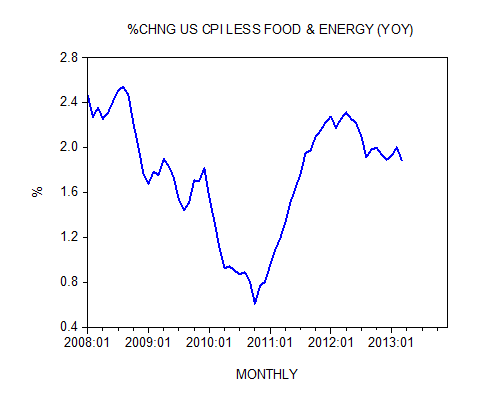 Also the growth momentum of the core CPI (the CPI less food and energy) has eased in March from the month before. Year-on-year the rate of growth has softened to 1.9 percent from 2 percent in February and 2.3 percent in March last year. For Bernanke and most experts, the key factor that sets the foundation for healthy economic fundamentals is a stable price level as depicted by the consumer price index. According to this way of thinking, a stable price level doesn’t obscure the visibility of the relative changes in the prices of goods and services, but enables businesses to see clearly market signals that are conveyed by the relative changes in the prices of goods and services. Consequently, it is held, this leads to the efficient use of the economy’s scarce resources and hence results in better economic fundamentals. For instance, let us say that a relative strengthening in people’s demand for potatoes versus tomatoes took place. This relative strengthening, it is held, is going to be depicted by the relative increase in the prices of potatoes versus tomatoes. Now in a free market, businesses pay attention to consumer wishes as manifested by changes in the relative prices of goods and services. Failing to abide by consumer wishes will lead to the wrong production mix of goods and services and will lead to losses. Hence in our case businesses, by paying attention to relative changes in prices, are likely to increase the production of potatoes versus tomatoes. This leads to a misallocation of resources and to the weakening of economic fundamentals. In short, unstable changes in the price level obscure changes in the relative prices of goods and services. Consequently, businesses will find it difficult to recognize a change in relative prices when the price level is unstable. By means of various quantitative methods, the Fed’s economists have established that at present, policy makers must aim at keeping price inflation at 2 percent. Any significant deviation from this figure constitutes deviation from the growth path of price stability (or at least stability in the rate of price-level increase). Observe that Fed policy makers are telling us that they have to stabilize the price level in order to allow the efficient functioning of the market economy. Obviously this is a contradiction in terms, since any attempt to manipulate the so-called price level implies interference with markets, and hence leads to false signals as conveyed by changes in relative prices. By means of setting targets to interest rates and by means of monetary pumping it is not possible to strengthen economic fundamentals, but on the contrary it only makes things much worse. Here is why. Let us say that the so-called price level is starting to exhibit a visible decline in growth momentum. To prevent this decline, the Fed starts to aggressively push money into the banking system. As a result of this policy, after a time lag the price level has stabilized. Should we regard this as a successful monetary policy action? The answer is categorically no. Given that monetary pumping sets in motion the diversion of wealth from wealth generating activities to non-wealth generating activities, obviously this leads to the weakening of the wealth generation process and to economic impoverishment. Note that the economic impoverishment has taken place despite price level stability. 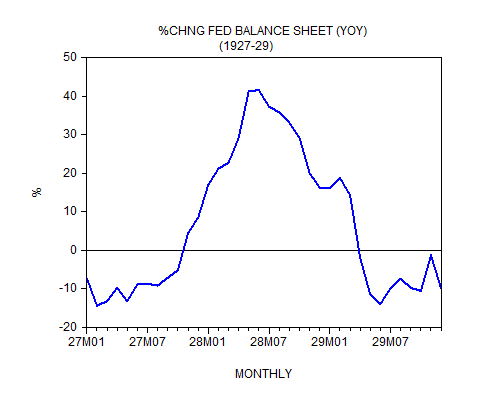 Also, note that in order to achieve price stability, the Fed had to allow an increase in the growth momentum of its balance sheet and consequently in the growth momentum of the money supply. It is the fluctuations in the balance sheet and the subsequent fluctuations in the growth momentum of the money supply that matter here. It is this that sets in motion the menace of the boom-bust cycle, regardless of whether the price level is stable or not. While increases in the money supply are likely to be revealed in general price increases, this need not always be the case. Prices are determined by both real and monetary factors. Consequently, it can occur that if the real factors are pulling things in an opposite direction to monetary factors, no visible change in prices might take place. 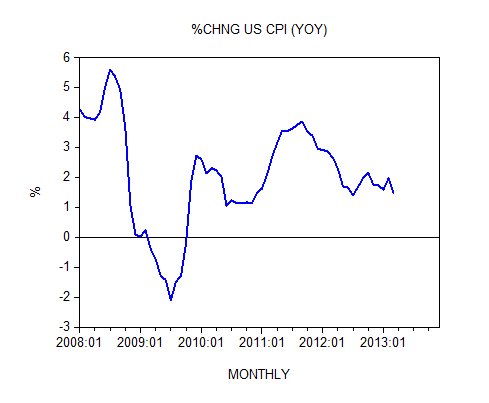 In other words, while money growth is buoyant, prices might display low increases. “The fact that general prices were more or less stable during the 1920s told most economists that there was no inflationary threat, and therefore the events of the great depression caught them completely unaware” (America’s Great Depression, Mises Institute, 2001 , p. 153). 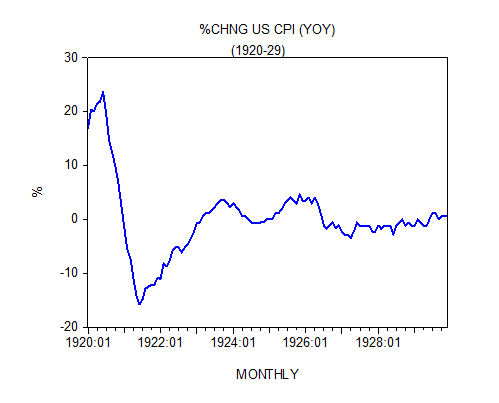 The yearly rate of growth of the CPI displayed stability during 1926 to 1929 (see chart). Most experts have ignored the fact that the yearly rate of growth of the US central bank balance sheet jumped to 42 percent by June 1928 from minus 14 percent in February 1927. The sharp fall in the growth momentum of the Fed’s balance sheet after June 1928 (see chart) set in motion an economic bust and the Great Depression. 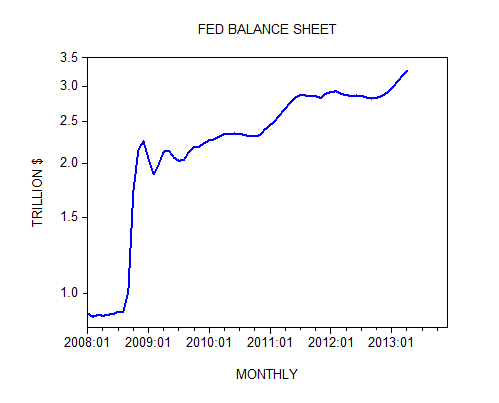 At present, the Fed continues to push money aggressively into the banking system with its balance sheet standing at $3.3 trillion at the end of April against $0.9 trillion in January 2008. 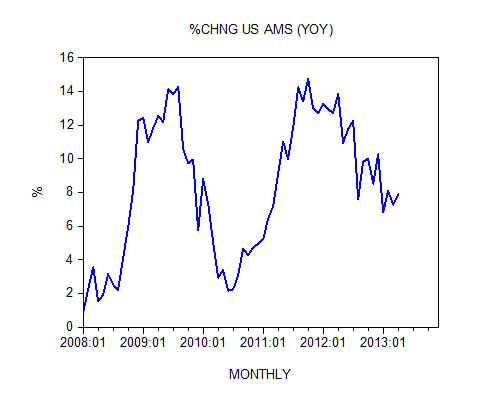 We suggest however that a fall in the growth momentum of AMS since October 2011 raises the likelihood of a bust in the months ahead. If one adds to all this the possibility that the process of real wealth generation has been badly damaged by the Fed’s loose policies, it shouldn’t surprise us that we could enter a severe slump in the months ahead. For most economists, the key to healthy economic fundamentals is price stability. A stable price level, it is held, leads to the efficient use of the economy’s scarce resources and hence results in better economic fundamentals. It is not surprising that the mandate of the Federal Reserve is to pursue policies that will generate price stability. We suggest that by means of monetary policies that aim at stabilizing the price level the Fed actually undermines economic fundamentals.